The Holy Month of Ramadan has just ended on Sunday. It was a full month of fasting and sacrifices for all of our Muslim brothers and sisters around the world. That includes the Muslims who migrated to Ilocos region. I had the chance to witness the celebration of the Eid ul-Fitr when I went to Brgy.1 of Laoag City where the Muslim community is located. 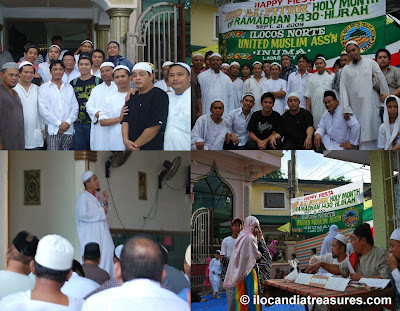 They call their group as Ilocos Norte United Muslim Association (INUMA). There is a population of more than 3,000 Muslims in the area. 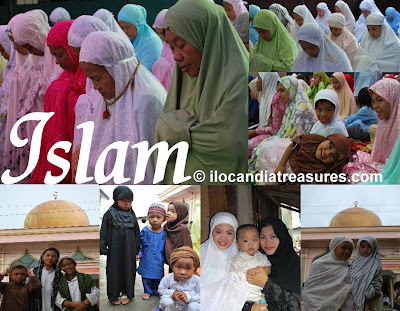 They migrated from Marawi City and other places in Mindanao since the 80’s. They are mostly Maranaos. They operate their own businesses in downtown Laoag. It is where I met Faisal whom I asked about the details of this celebration. Eid ul-fitr is a festival of breaking the fast. This is a big day of celebration. Muslims are required to complete their fast on the last day of Ramadan. They have to recite the Takbir all throughout the period of Eid. They have to wake up early in the morning, dress up the best, take a small breakfast and attend the special Eid prayer at the mosque. They ask for forgiveness, mercy and help for all living beings and visit their relatives, friends, and even graveyards of the departed loved ones. Lastly, they would all feast on the special dishes and food they prepared. I thought I could not catch up with the celebration since I was late but when I arrived at the Muslim village, I saw people clad in their traditional costumes. People were heading towards the event area coming from their houses. I saw the mosque, their place for worship. It is where they held their celebration. It was small mosque compared to what I have seen in other countries like Brunei and Malaysia. Muslim men were all inside and its jampacked. The Imam led the prayer and delivered the sermon. The women and children were grouped accordingly and seated on carpet outside as they listened. There was a reception area where faithfuls give some donations in the form of sadaqa, petra and salawat. It is where I sought permission to take photos of the event. They even thought that I was a balik-Muslim. They were accommodating and children were amused of my camera and they playfully posed for shots. After the prayer, I interviewed some of them including a Muslim British national who comes to the Philippines twice a year and a convert who used to work in Saudi Arabia. They explained tome the significance of the celebration. They were even encouraging me to convert to Muslim. I just smiled anyway. They invited me to come again the following day for Eid ul-Adha where they will serve food but I had previous engagements. One of the Muslims gifted me with a Muslim cap as a souvenir. I was happy for this wonderful experience of Islamic culture.